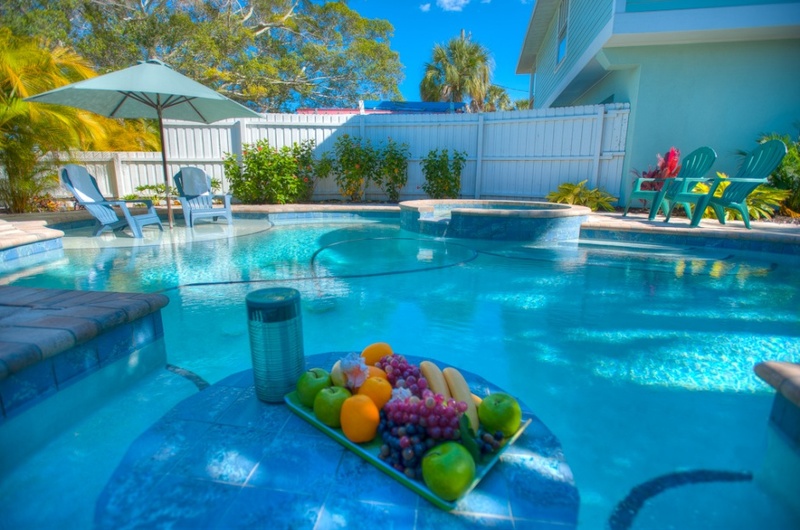 When looking for Anna Maria Island vacation rentals, everyone has their own specific tastes. Some want an oceanfront villa, others want a high-rise condo with a beautiful view of the sunset dipping behind the Gulf waters. The Lighthouse Lagoon is a big home with an even bigger backyard. 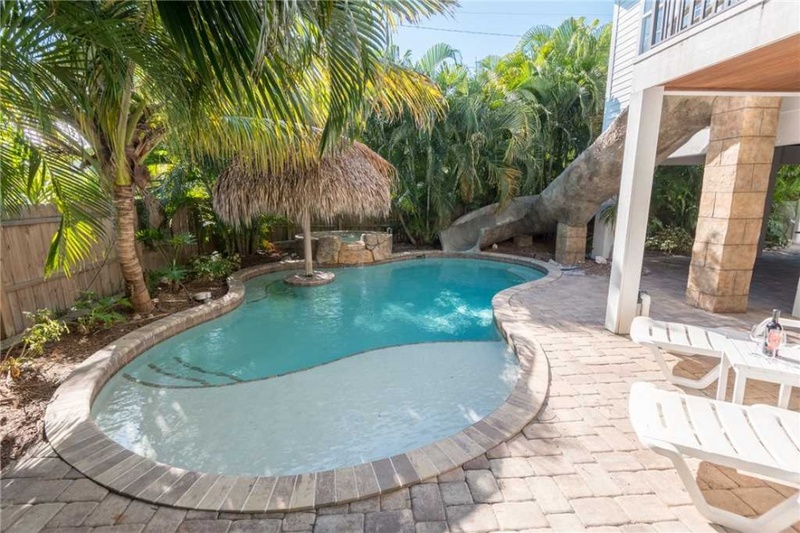 The five-bedroom rental has an enormous pool with a deck-chair-topped island in the middle surrounded by palms. It boasts a large covered dining area below the house – perfect for large families who love to cook. If you want to surprise the kids with something special this year, a vacation at South Seas may be it. 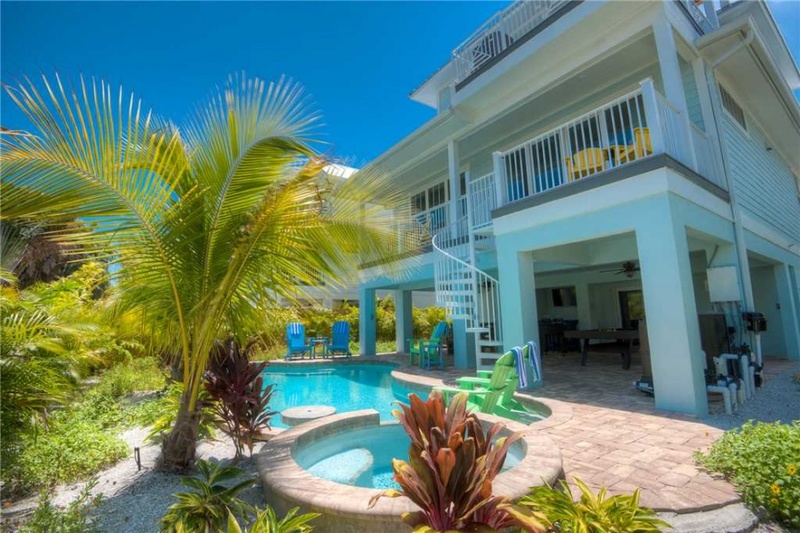 This Holmes Beach vacation rental features a large pool, raised, natural rock hot tub, and a story-high water slide. The pool also has a small seating area covered by a thatched umbrella – true island living. The home features six bedrooms, two balconies, and ocean views. This villa-style bungalow is perfect for smaller families who love the pool. 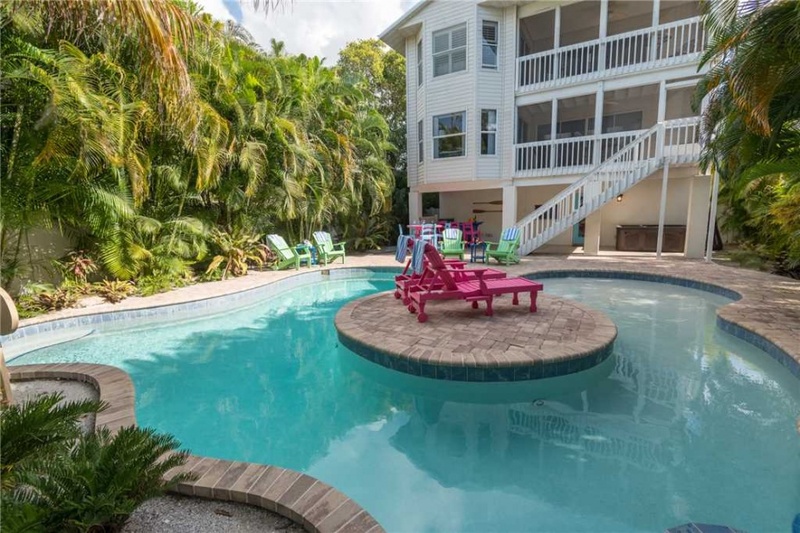 Located in Holmes Beach, it has a private heated pool with an in-pool bar table and bench so you can have a cocktail in the water. It also features lounge chairs and outdoor seating on its sunny patio. It has two bedrooms and 2.5 bathrooms. Summer Breeze is the ultimate party house. 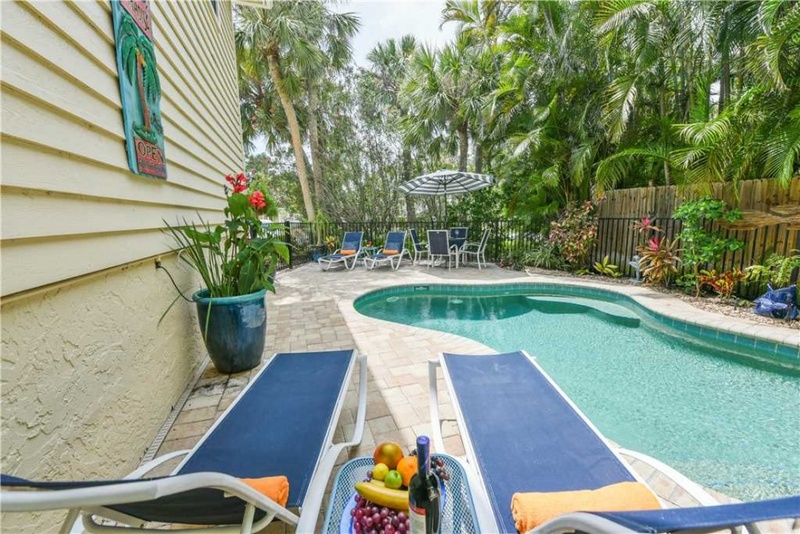 One of the best Anna Maria Island vacation rentals for groups this house sleeps up to 14 people. It has a huge backyard with a pool, ping pong table, pool table, and jacuzzi. It also has a covered dining area, and a huge second-floor screened in porch, as well as a fenced-in lawn. 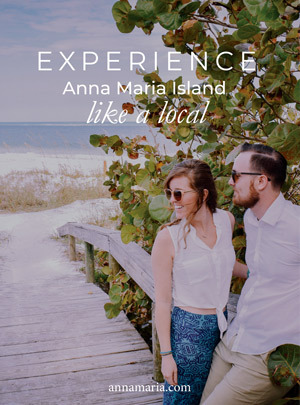 It’s located in the beautiful north end of Anna Maria Island. Beach Bliss is a mid-sized, two-bedroom, two-bathroom home that sleeps four people. It has a giant pool that fills the backyard with an aqua blue color and is dog-friendly. 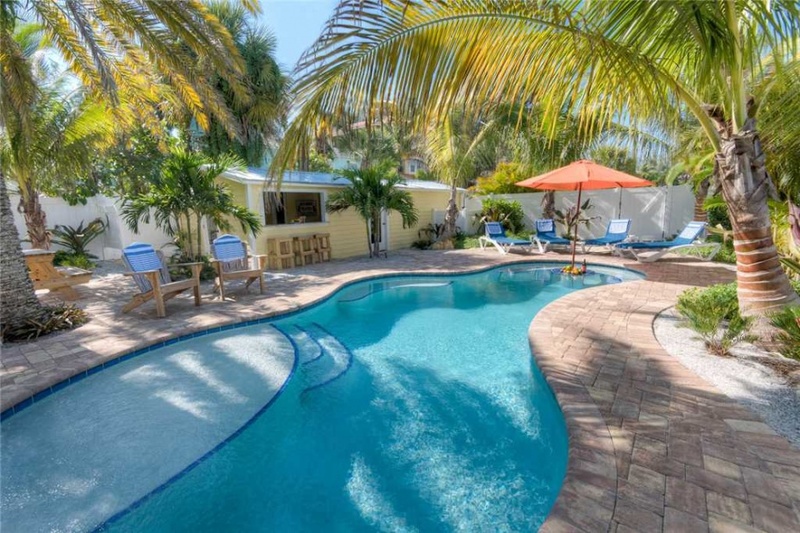 Our Anna Maria Cottage is another vacation rental with a great backyard. Expect a pool, backyard bar, barbecue and cozy outdoor furniture. This cottage sleeps six people, and has a large wrap-around front porch. This five-bedroom, four-bathroom rental sleeps up to 14, and has a large heated pool and jacuzzi, foosball, and a spacious outdoor dining area. It is located on the north end of Anna Maria Island. 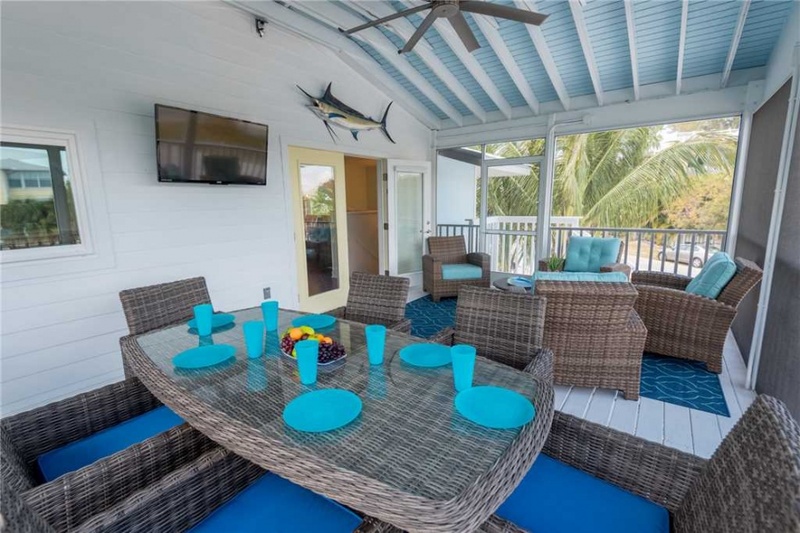 One of our best bayfront Anna Maria Island vacation rentals, this rental is perfect for families who love boating and fishing. It has a large backyard with a pool, patio, and lawn, and is surrounded by trees. It is located in Holmes Beach, and has a dock looking out over the bay. This Holmes Beach rental is smaller in size with two bedrooms and two bathrooms, but has all the amenities. 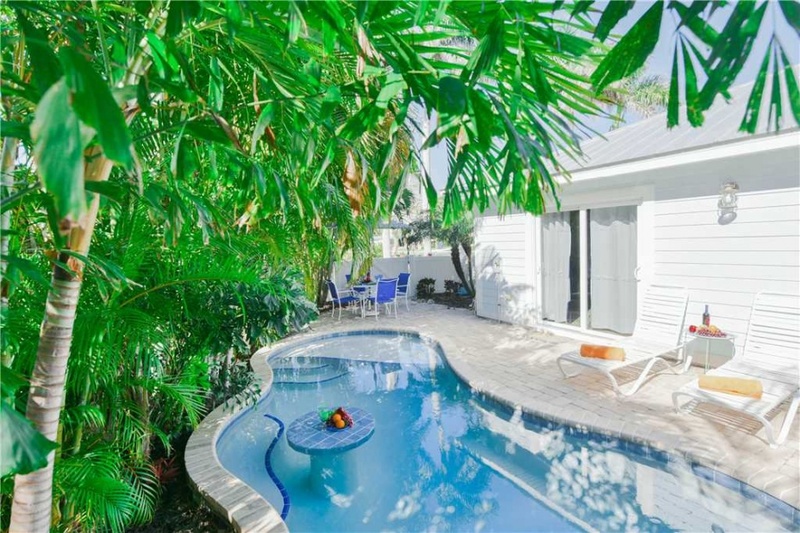 It has a cozy backyard pool surrounded by lush tropical plants. Its minimal style, simple lounge chairs, stainless steel grills, and side lawn make it perfect for small families with both kids and pets. The name says it all: this Old Florida-style cottage backs right onto the beach. It has a medium-sized pool that juts right up against the beach – listen to the crashing waves and watch the sky explode with color as you float in a warm pool. The yard is fenced in – perfect for families with younger children – and offers incredible bay and sunset views. 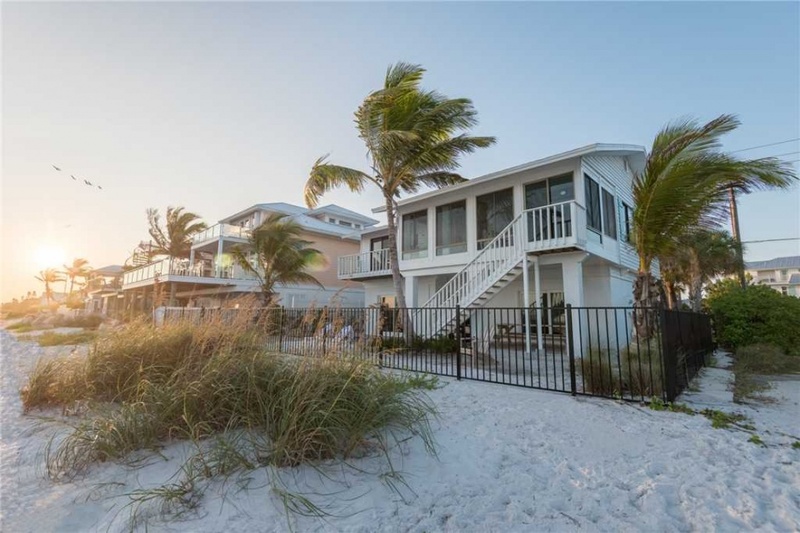 The home itself is a two-story, three-bedroom home with floor-to-ceiling windows on the north end of Anna Maria Island. Looking for more AMI Rentals? To learn more about our homes that feature incredible backyards, give us a call today at 941-778-4178. We have rentals of all sizes, many with plenty of outdoor space and great views, to help you enjoy Florida’s nature while on vacation.